Calculoid is a platform for creating interactive web calculators which can be easily integrated with your WordPress. Features such as online payments or emails submissions will enhance your e-commerce and lead generation capabilities. You do not have to be a web developer to create your own online calculator in just a few clicks. Get it touch with your visitors who used your calculator. 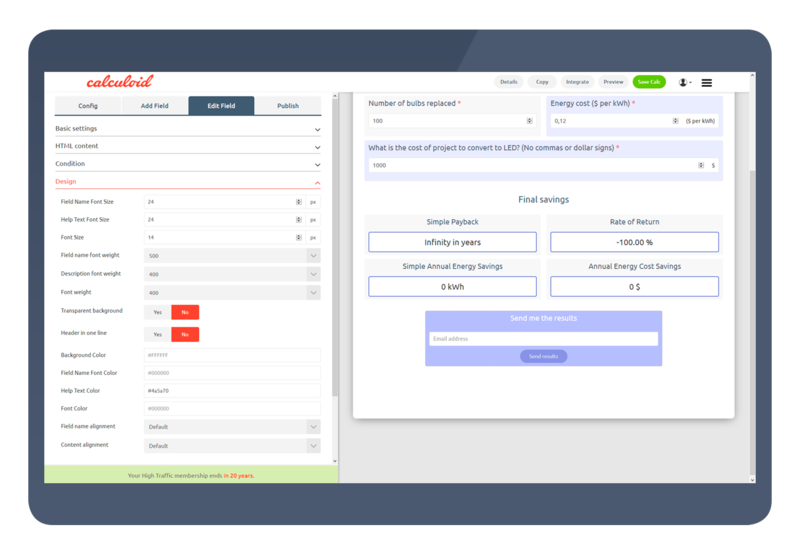 Allow users to send calculation results to their email to generate new leads for your mailing list. Connect calculator to your Stripe or PayPal account and get paid online. Streamline your sales process with self-service pricing calculators and online payments. Calculate anything like in Excel Spreadsheet. Easily, online and in real-time. 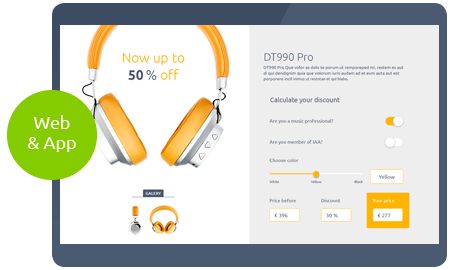 Design and brand your calculators easily so it looks like a native part of your website. All calculators, as well as transferred data, are secured with SSL encryption. Calculators can be embedded in any website or web application. Easily and with no effort. All Calculoid calculators are 100% mobile and touch-friendly. You do not have to be a web developer to create your own WordPress calculator in just a few minutes. In addition to the basic arithmetic calculations, Calculoid allows you to use popular Excel formulas, such as IF, sin, cos, log and others. 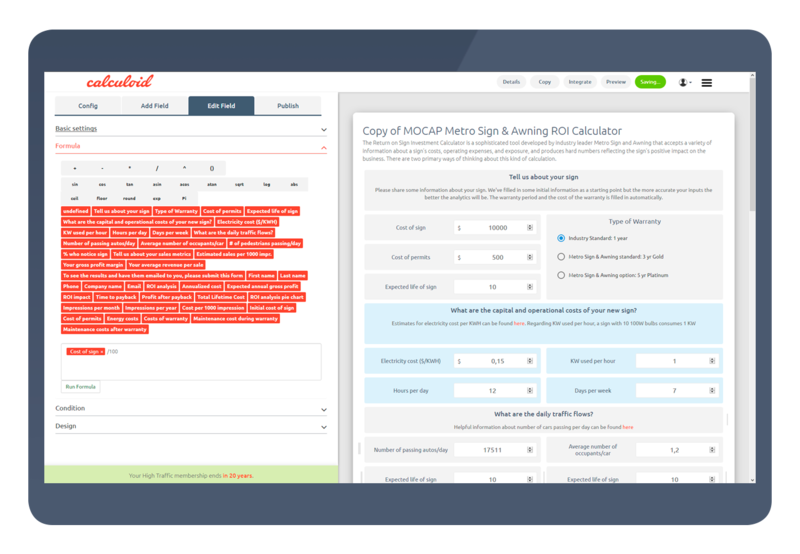 From basic 1+2 to complex volume discounting, Calculoid has endless capabilities. Get it touch with your visitors who used your calculator. 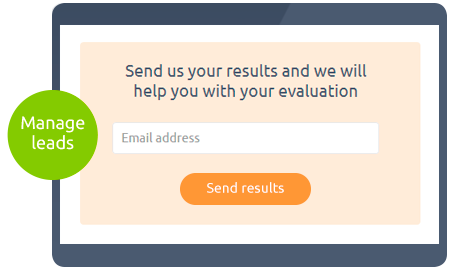 Allow users to send calculation results to their email to generate new leads for your mailing list. 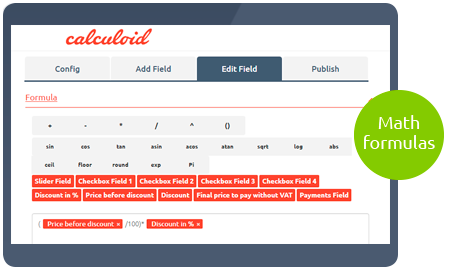 Or even use Calculoid as a a full-featured conversion form - it is easy to create and manage! Create your own web calculator in a matter of minutes. Test all features in the 14-day free trial. Customize your fields, calculation or design easily in an intuitive drag & drop wizard. To download the latest version of your WordPress plugin, simply use this link. When the download is complete, just follow the instructions for installation. Calculators can be embedded in any WordPress website or web application. Easily and with no effort. Calculate anything. Choose a template or start from scratch. 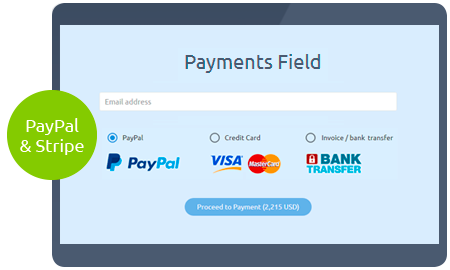 Boost your website interactivity, generate leads, accept payments. Calculate prices for products or services in real time and get paid online. Calculate ROI of your products and services and collect customers leads. Any finance related calculations for your users - insurance, loans, debts. 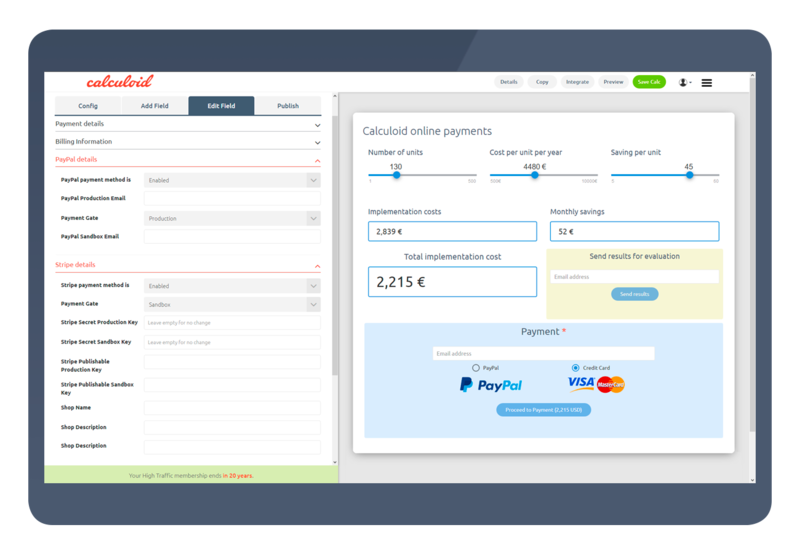 Calculate the costs of projects or services online & easily. 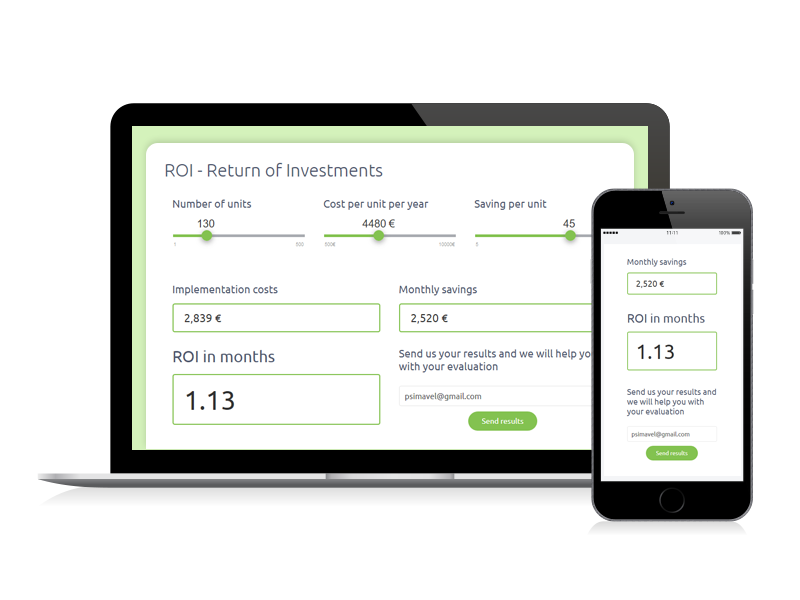 Calculate any saving for your customers and send email to collect the leads. 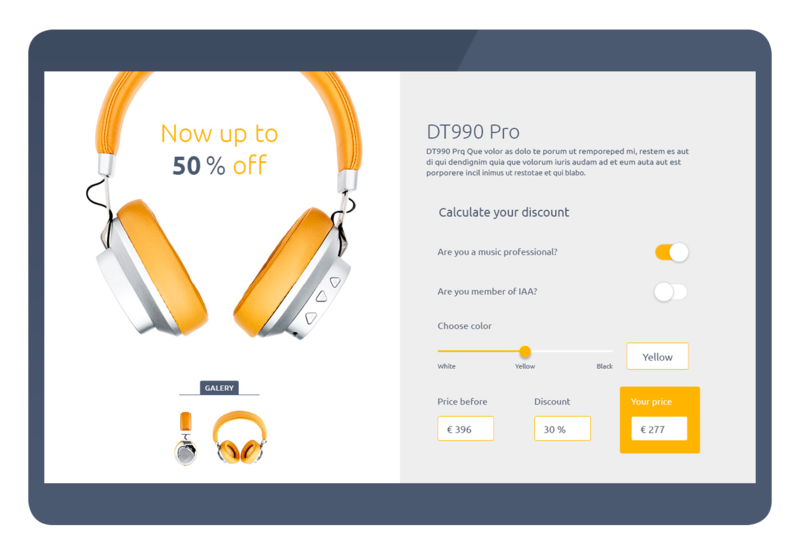 Create a simple online store, calculate the final price and get paid online.